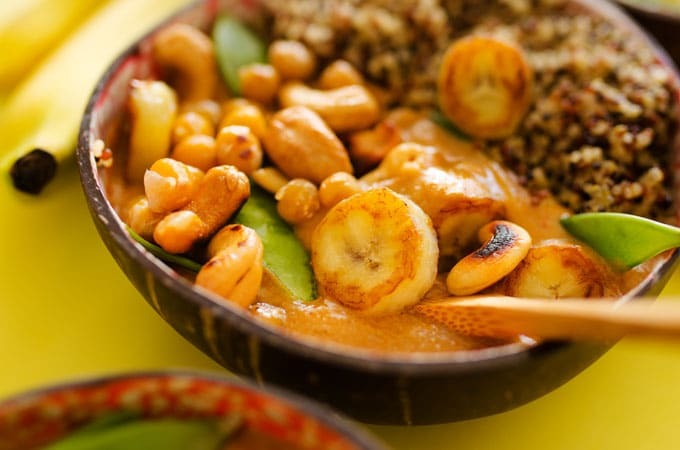 This Banana Thai Curry is a simple, healthy way to enjoy Thai curry with less fat and calories! 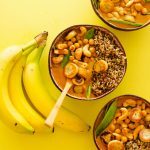 This post is in collaboration with iHerb. Thoughts and opinions, as always, are my own. For the past two springtimes, my first two springs in Holland, I’ve learned a funny way of knowing the spring has sprung. It’s not the flowers or sunshine or warmth. It’s the parrots. Legend has it that 30 years ago, a pet owner set their green parrots free. They’ve since come to flourish in Holland, zooming about like bright green lightning streaks, letting us know that spring is here. And that’s sort of how today’s recipe is, delightfully unexpected! 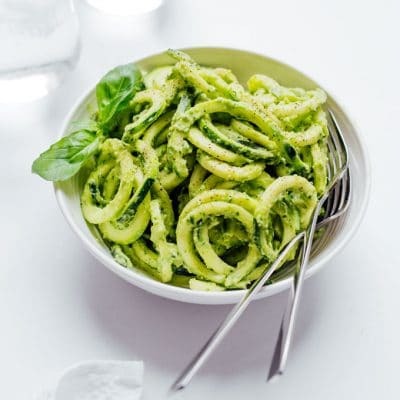 With spring on the horizon, it’s time we meander back to the light and healthy side of eating. 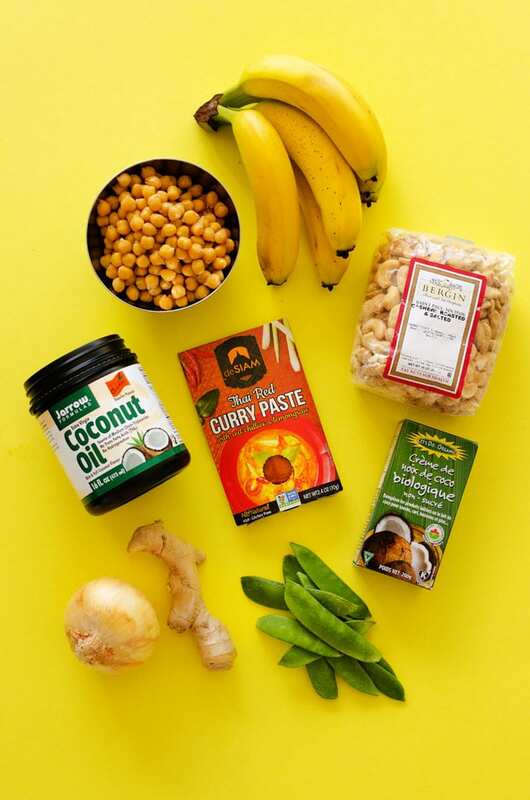 So today we’re subbing a rather unexpected ingredient into our curry to take the place of saturated fat-filled coconut milk…bananas! Today we’re using Jarrow Formulas Coconut Oil from iHerb as a base to our curry. It’s a high heat oil, meaning we can cook hot and fast without smoking the oil. Then we’ll throw in a few heaping spoonfuls of deSiam Thai Red Curry Paste, a really great paste full of authentic flavor. I love flavorful pastes like this because they bring so much life to recipes, without adding tons of fat or sodium. We’ll supplement our banana base with a few spoons of Edward & Sons Coconut Cream. 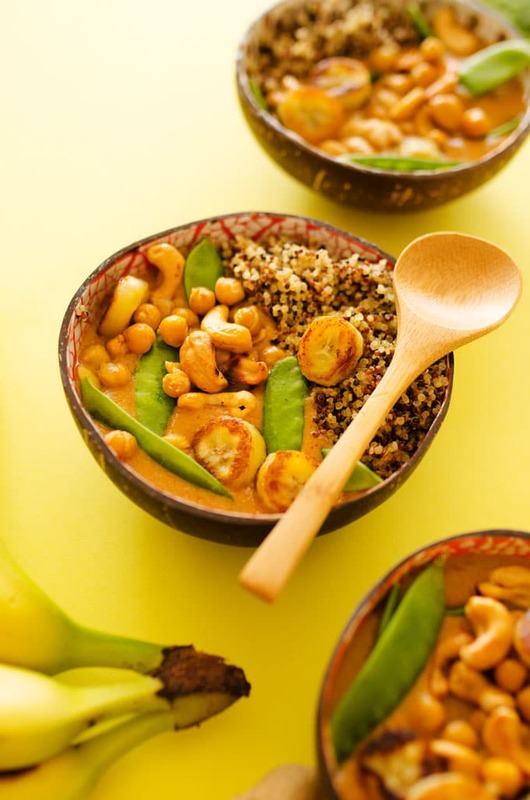 And finally, we’ll top it all off with toasted Bergin Cashew Nuts, which are a super great source of unsaturated fats. 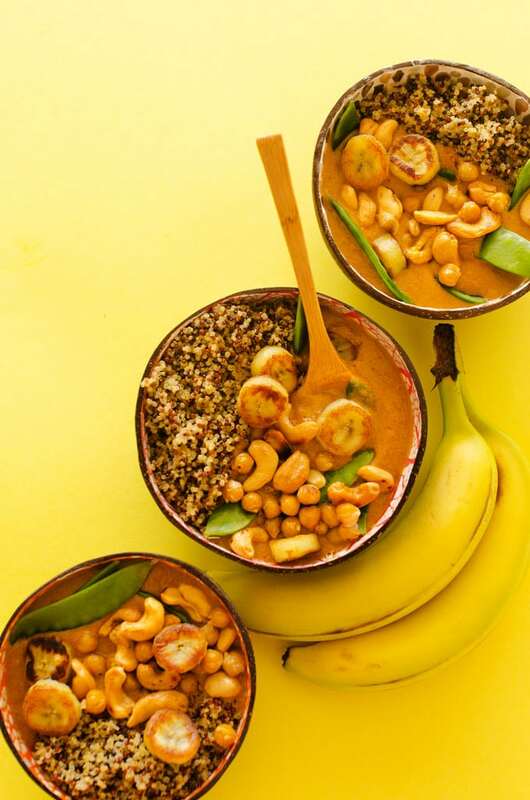 This Banana Thai Curry, with mashed bananas, red curry paste, chickpeas, and cashews, is a simple, healthy way to enjoy curry with less fat and calories. Slice 2 of the bananas into ½ inch thick rounds. Heat 1 tsp oil in a large wok over medium/high heat, and add the bananas. Cook until lightly browned, about 3 minutes on each side. Remove bananas and set aside. Heat another 1 tsp oil in the wok over medium heat. Add onions, ginger, and curry paste, stirring and cooking until nice and fragrant (about 3 minutes). Add 2 Tbsp coconut cream and continue cooking. Meanwhile in a separate bowl, mash 2 of the bananas with a fork. To the mashed bananas add broth, coconut milk, soy sauce, and chili garlic sauce. Whisk to combine then add to your wok. Continue cooking for 10 minutes, or until curry is hot and fragrant, Taste and add more curry paste if desired. To serve, spoon rice into serving bowls, followed by curry. 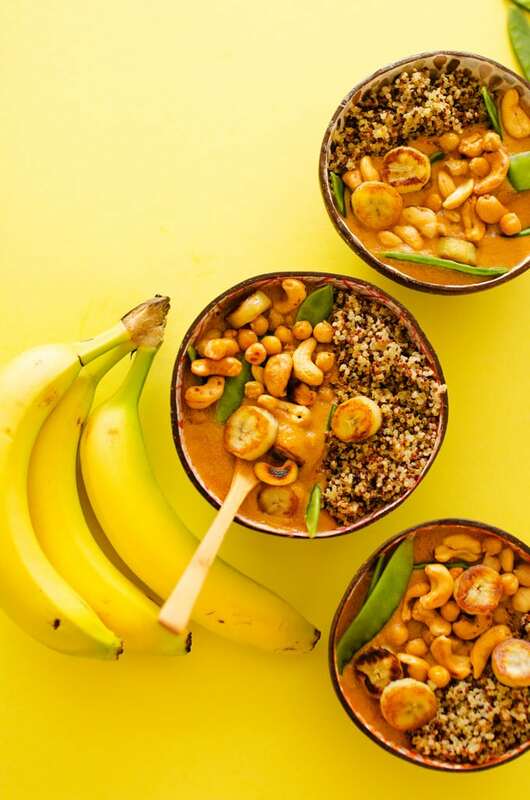 Top with a generous handful of cashews and chickpeas, a few banana slices, and a few sugar snap peas. *You can buy coconut cream either canned or just skim 2 Tbsp of cream off the top of a can of coconut milk. 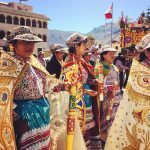 Thanks so much again to iHerb for sponsoring this post. 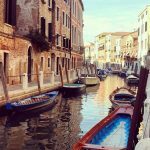 This website is great for getting a lot of your specialty item grocery shopping done (plus new customers will get $5 off their first order). They’re a Google Trusted Store and their Customer Service team provides support in 10 different languages, so definitely check them out! Tried this tonight but my fried bananas turned out mushy…advice? What did I do wrong?